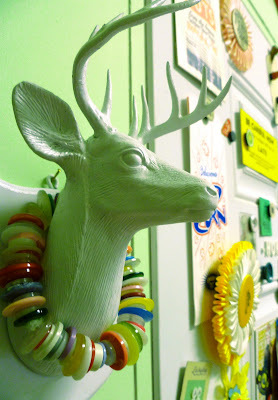 My tiny studio received another wonderful feature thanks to Kim of Everything Etsy! So I figured it was a great time to share some updated photos of my space, after all, I’d just spent the last day cleaning it. So take a good look around, it won’t look like this tomorrow! 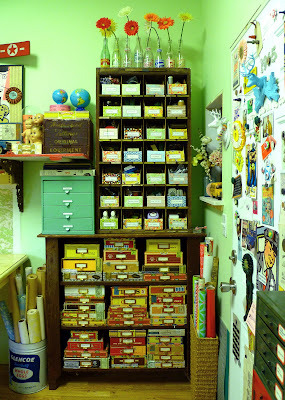 Since my last set of photos, found on Flickr HERE, you’ll see I’m quite a bit more about organizing than decorating, though I still have plenty of eye-candy to keep my buzz going. You can click on any of the photos to enlarge enough to spy little cobwebs. I removed all the storage under my work table so that I can actually sit at it without cramming my legs into card cabinet drawers. and Kewpie is still around, but is currently the boy-in-the-bubble. I also moved my small-compartment mail slot piece out into the garage in a new area I’m still working on and hope to share soon. I replaced it with a shelf unit to hold my new obsession with cigar box storage. I moved my bin storage on top of that. My main desk area hasn’t changed much, but I could sure use a new office chair, the up-down mechanism is shot. I scored another tool trug for next-to-nuthin’ and pertied it up with red spray paint, some decals and vintage cigar labels. 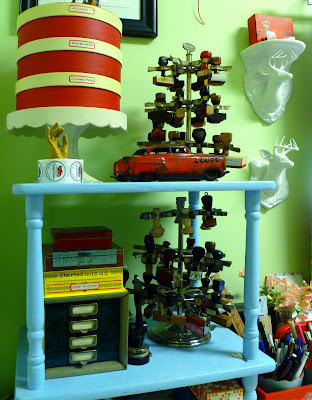 I now have 3 cool vintage rubber stamp racks to hold my assortment of stamps and a cute tiny empty 4-drawer cabinet begging to be used. The little green stool in the corner (below) is one I bought just for my husband for when he comes in for a visit so he has something to sit on, but for now, it holds my ice cream bucket waste can. I brought in my library of Dover books and various other art resource books from the bookshelves in my living room and keep some under my desktop printer, and some in my upside-down yellow cupboard. Oh, yeah, those are my Gocco printing sets from the early 90s. I’m lovin’ the awesome wooden alphabet wall art I received with my new Eames font from House Industries! 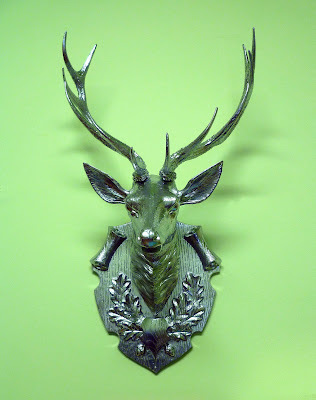 I’ve still got that faux deer head fetish. I sprayed this one with Sterling Silver spray paint for a dynamic effect. This one likely came off an old cuckoo clock and holds my tiny tourist mobile. 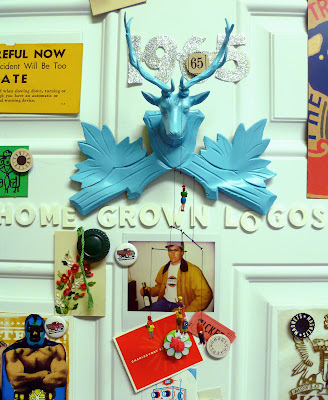 I painted it blue and added magnets to the back of it and it stays nicely in place on my metal door. This head, next to my door, was a sweet gift from my friend, Wendy. She found it at a garage sale and painted it white just for me. What a great friend! It now dawns a wreath of buttons I made some time ago. Thanks for visiting my favorite place on earth, I hope to get some more shots of the rest of the garage space up soon! This entry was posted in Uncategorized and tagged craft studio, Design Studio, studio organizing. Bookmark the permalink. wow! this looks like a wonderfully inspiring place to create! you are truly blessed! 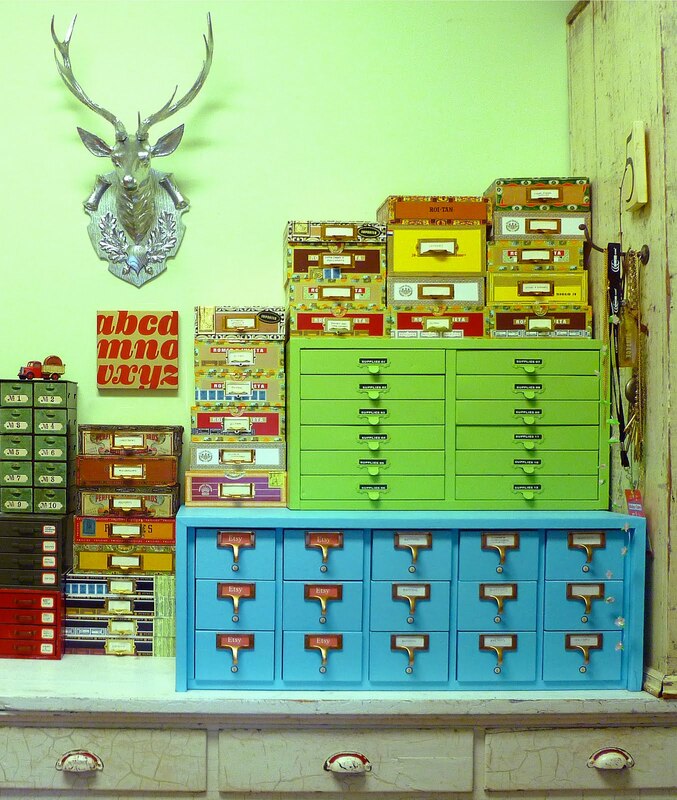 Holy cigar boxes! I just inherited my first…had to practically throw the cigars at golfers at a tournament I worked at Monday to get rid of them all! your place is full of inspiration. no wonder you have such great ideas! Me encantaria tener un estudio así solo para mí.Que envidia.Chao. LOVE your space! I have to go and organize mine-bye! Oh Cath you should have so played along in last month Where Bloggers Create Blog event. 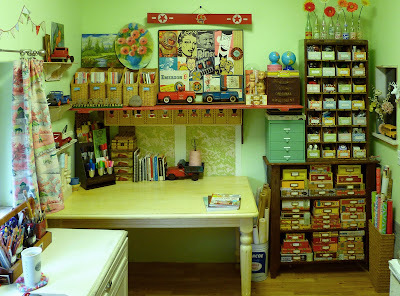 I'm sure Jo would have picked your fabulously organised studio for a feature in the next WWC mag! 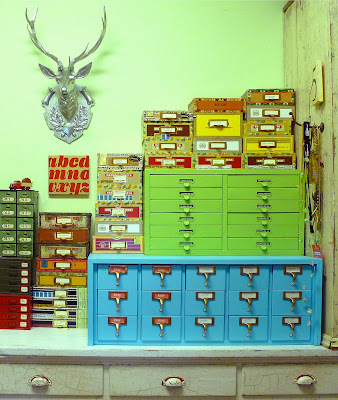 I love all your many drawers and boxes and the stamp holders and the deer heads, simply fabulous! Hope you'll upload these new photos to flickr and add them to the Vintage inspired studio group! I love it all! I wish you were my neighbor…hehe! I have a red tool caddy in my kitchen to catch all the keys and cell phones. I painted a chalkboard area on one side that I write on. I love them and wish I had more! Thanks so much for sharing more photos. It really received an amazing response on my blog. It's a curio WONDERLAND! 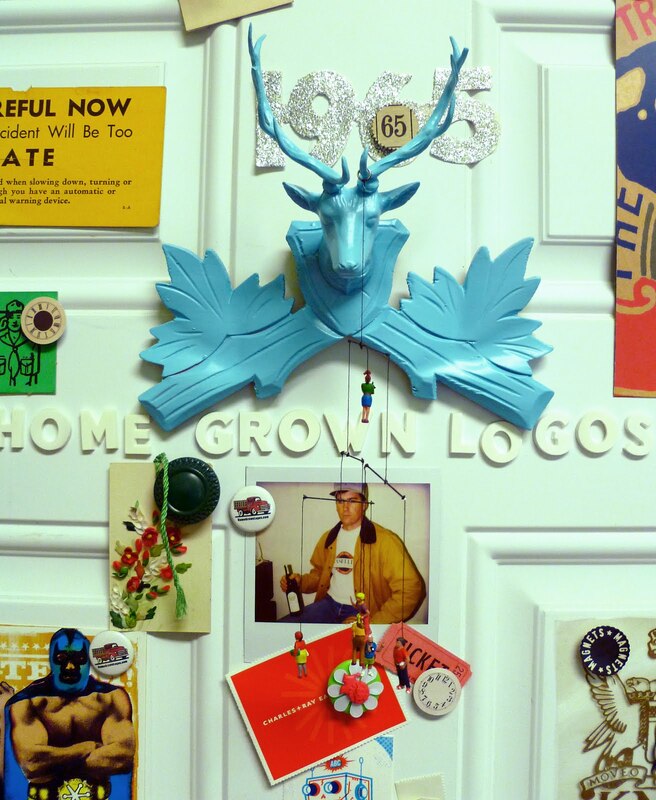 I have label envy the likes of which cannot be explained – YOUR SPACE is to die for, sweet sista of the craft! I'm dizzy and my eyes are swollen from staring at the goodness! It's NO WONDER you can access the creativity spout so easily! What a TERRIFIC use of space! Yee Haw! my gosh its like ive died and gone to heaven! Your place is crammed with amazing bits and bobs. Love it all. Keep up the inspiration and may you keep getting inspired. I love it all! Can I come over and just dig through your stuff?! So much to see and ohhhh and ahh over!! Thank you! 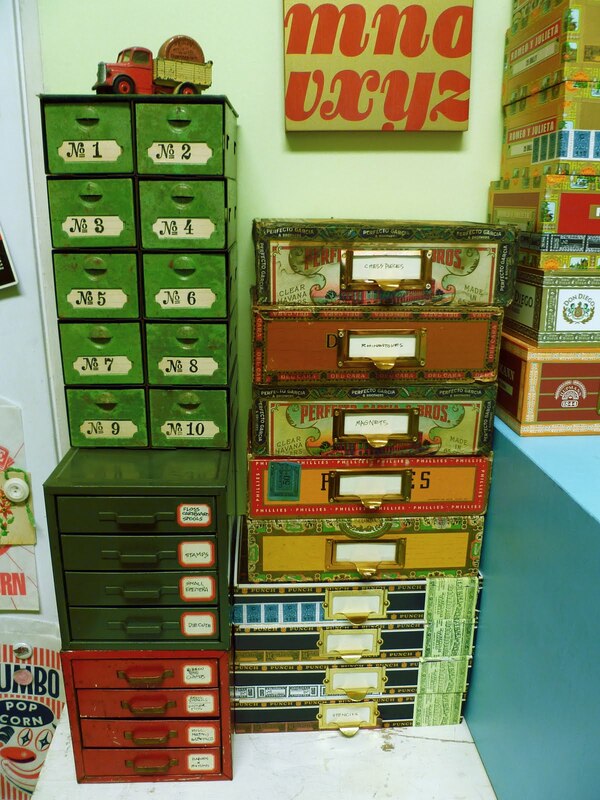 I love the cigar box storage! Great looking space, where a creative mind could go wild! You have a wonderful and colorful workspace! 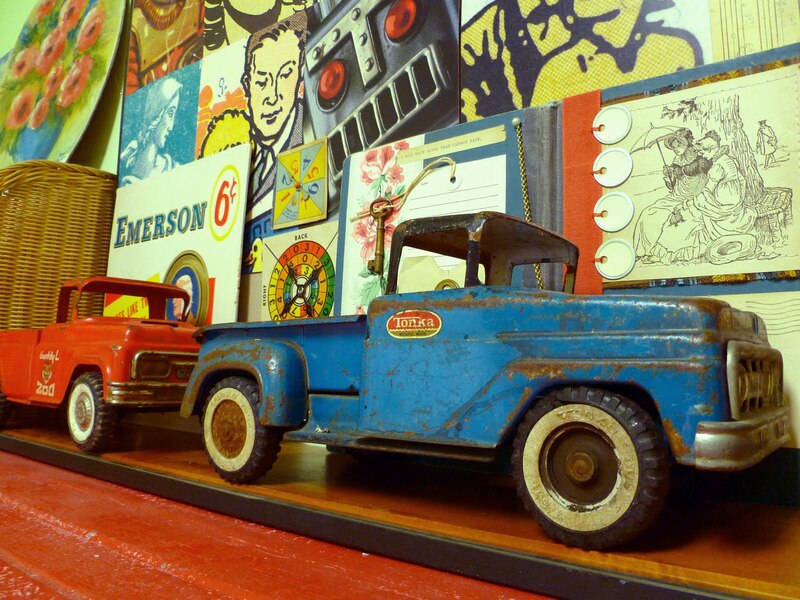 Your space looks wonderful with all those different areas for storing things, and all the decorations – kewpie dolls, trucks. Looks like a wonderful place to work from. Oh Cathe! A fabulous space! Just love all those little drawers – they're really my thing! love your studio! it's so creative & organized – my favorite combination 🙂 thanks for sharing! 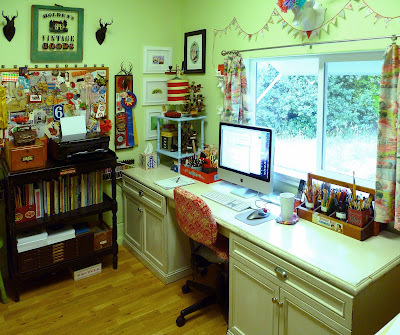 What a beautiful space and SO MANY wonderful ideas…thanks for sharing! 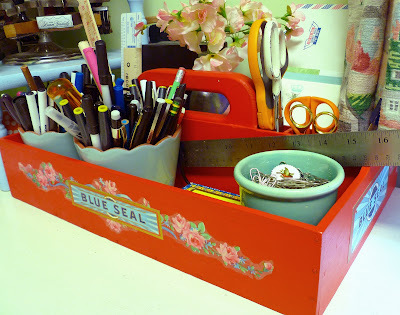 I just love all the bins and compartments for storage. The colors are wonderful!! 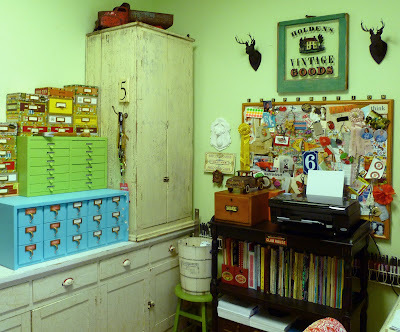 I just love your space and all those super amazing storage boxes and cabinets… And all those colours and the vintage pieces, OMG, I just love it… what a great inspiration. You really do have a wonderful space. I LOVE IT! looks like a very fun place to be! Oh, Cathe thanks for the tour of your space again. I just love it and you make me want to go work with my stack of cigar boxes! You have one of the most fabulous spaces around! Thanks for sharing the update!!!!! I love your place! Hi Cathe, over the past couple months, whenever I've gotten a few minutes, I have been catching up on all your old posts and you feel like an old friend now…your blog is so incredibly inspiring. Thank you for all you share. 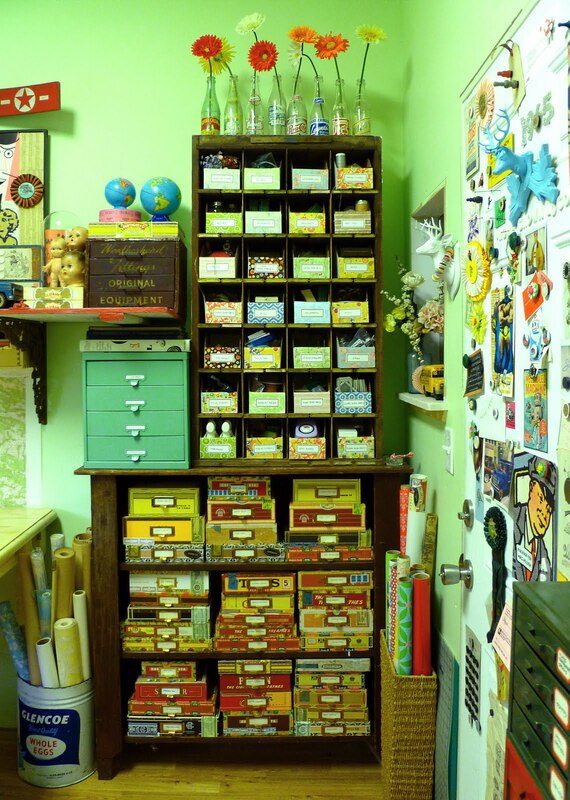 Great space — could you come organize mine since I am currently avoiding mine. I am jealous! I wish I had a workspace other than the kitchen table! I really like your green walls and all the storage ideas. I'm currently re-organizing my space. It's been an ambitious undertaking for sure. Yours looks great and I'm inspired. Thanks for the peek. need to go back and take another peek. Oh my! How awesomely amazing! I discovered your amazing site about 2 days ago and am in awe. I love all things vintage and pretty and am nuts about art. Yours will be a regular spot I visit for sure! Your studio is simply overflowing with creativity! I love the colours and your cigar boxes are gorgeous. Thanks so much for sharing. and i adore those cigar box drawers! that looks like such a fun place to work! Thanks for sharing it with us..I love the ice cream maker..I think I can use that idea! You are the best! Beautiful space! So much to inspire you!! I love the sweet pea pod and hydrangea so much, I'll need to try them in the near future. Thanks so much for sharing your creativeness! p.s. too funny, the robot check thingie says cathelo! Great inspiration from that room!!! These pictures are fantastic. We have some similar ideas for storage, but you are much better organized than I am right now. I need to look at your photos each day until I get my space cleaned up. Great inspiration! Wow, what a great place to be creative in ! Love it ! How utterly inspiring! You've given me some great ideas! Absolutely incredible studio! 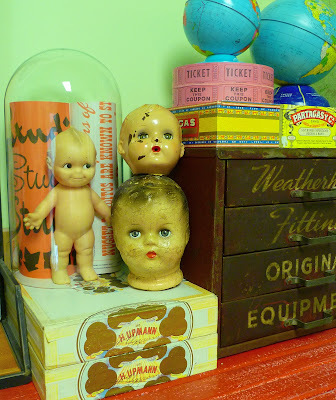 I love your kewpie and all your vintage toys. I like to decorate my studio with them as well. This looks so VERY, VERY organized…and neat, like you don't even want to mess a THING up by actually working there..but somehow, I think you DO !!! Just kidding, we know you do..and we are so appreciative of that fact and for all the wonderful SHARES you afford us. Thanks for showing us around your world. I love your space! 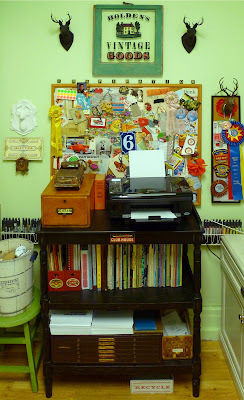 I am in the market for a big ol' desk and wonder where you got yours – it's perfect! 72", right? 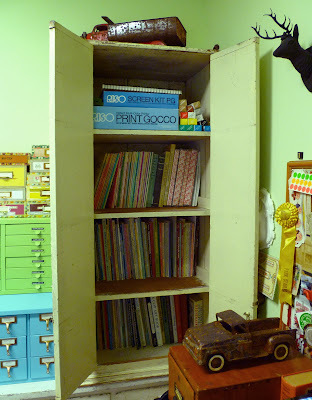 I've been wanting a card catalog cabinet for quite some time and you've just pushed me over the edge to find one!!! 😉 My husband thanks you! LOL! I just wrote about your studio on my blog. Totally inspiring! I am so jealous of your incredibly organized and beautiful workspace. If I had my own room to create, I'd probably stock it up with everything I need and never come out:) Oh well, one of these days. cathe, your studio proves you're a bit mad. i love it! What a fantastic studio space! I want a desk like yours! Is it a real desk, or two cabinets with a flat surface on top? I love all of the fabulous inspiration here! TFS!!! You put it all together so nicely, but most of all, I love the Erma Bombeck quote. What a witness. ADORABLE! What a magical space. Thanks for sharing! You are amazing… i love all your collections .. wow! WOW! What a FUN place to spend some time! How could you not be inspired in there?! Wow, I think that is all I can say because I can't even close my mouth, I think I am drawing flies! Your space is amazing, I could stare at it all day. No wonder it is your most favorite place to be! I can only dream of having a craft room this organized and beautiful. You are my crafting god! I’ have not looked through all of your items but from what I see on the first page isthe best one I’ve seen so far. I’m excited to see what you have to offer. Wow!!! Loves every idea!!! I came to this site to see what you had done with your cigar boxes …I have a great time looking ….